The New Delhi Municipal Council (NDMC) finally set up the long-awaited ‘reverse vending machines’ in three blocks of Connaught Place on Monday. 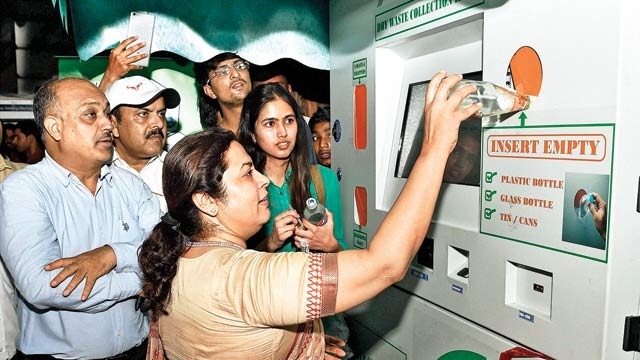 The machines will transfer Rs 1, 2 , 5, and 10 to the e-wallet of a person depositing a plastic bottle or a can.New Delhi MP Meenakshi Lekhi inaugurated the machines, installed at A, E, and F blocks. “It is a first-of-its kind machine. It is aimed at promoting behavioural attitude and motivate people to throw plastic bottles and cans here only. It will help segregate waste and encourage people to not litter the roads,” Lekhi said. Once a plastic bottle or a can is dumped into the machine, the cash will get directly transferred to the user’s e-wallet. The machines have been installed as part of innovative technologies to be used to manage waste in Lutyen’s Delhi under the Smart City initiative. “When people visit a tourist spot or a market place, they are likely to have a bottle of water or soft drink or wrappers, which they will need to dispose. The machine will recycle the waste, which is a scientific solution to manage waste,” NDMC Chairman Naresh Kumar said. The civic body had earlier installed two such machines, which would have churned out freebies such as coupons, but they were not a success.The Council now plans to set up 20 such reverse vending machines across the area within this year, officials said.